Hemp Babies Little Weeds is made from natural fibres, 55% Hemp and 45% Certified organic cotton. Serged with natural thread and seamed to ease folding. 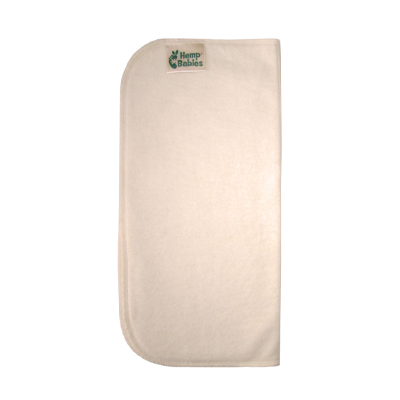 Two layers of hemp to ensure sure that your nappies wash clean easily and dry quickly. Designed specifically for an infant, the small insert folds in half for less bulk and four layers of absorbency. Can be used to boost other nappies. Great for boosting pocket nappies such as the BumGenius 4.0 or with any nappy wrap. Can be used as a preemie nappy with a cover, and eliminate the need to buy a preemie nappy if your baby is born weighing less than 8 pounds.